α-sheet is a protein secondary structure composed of residues in an alternating αR αL pattern. 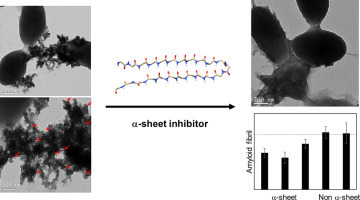 We have proposed that α-sheet plays a critical role in both the aggregation and toxicity of amyloid oligomers. Our work with disease systems revolves around the design of templated α-sheet peptides that inhibit aggregation and mitigate toxicity of the amyloid species in vitro and in vivo. Click this box to learn more. There are now over 50 known amyloid diseases that affect a variety of tissues throughout the body. Amyloid diseases are characterized by the aggregation of peptide/protein monomers into toxic, soluble oligomers, and eventually mature, insoluble plaques that are relatively nontoxic. We have proposed that α-sheet plays a critical role in both the aggregation and toxicity of soluble oligomers. Our work with disease systems revolves around the design of templated α-sheet peptides that inhibit aggregation and mitigate toxicity of the amyloid species in vitro and in vivo. We use a variety of standard and novel techniques to help us define the role of α-sheet in amyloid diseases, including: spectroscopic characterizations; cell-based assays; testing in relevant animal disease models; and structure-based assays. 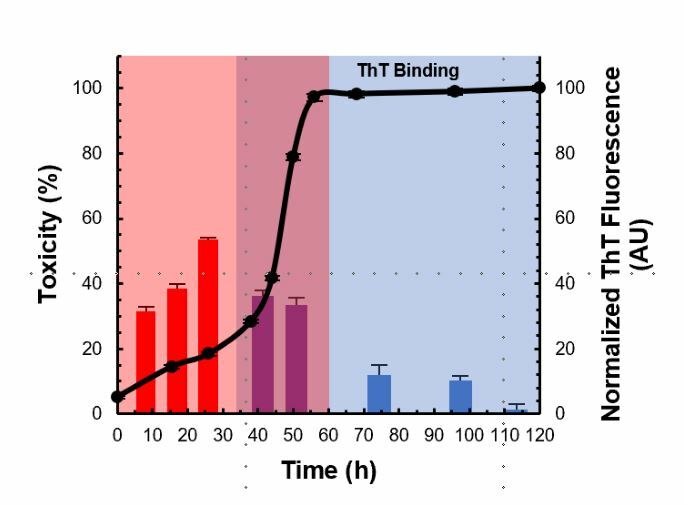 We have found a strong correlation between α-sheet content and toxicity and are developing a plate-based Soluble Oligomer Binding Assay (SOBA) for detection of toxic species. Bi, T.M., Daggett, V. The role of α-sheet in amyloid oligomer aggregation and toxicity, Yale Journal of Biology and Medicine, in press, 2018. Many bacteria produce extracellular amyloid fibrils which are biochemically similar to those formed in mammalian disease, but unlike pathological amyloids, bacterial amyloids are intentionally produced to play a functional role in stabilizing the biofilm. Click this box to learn more! Healthcare-associated infections (HAI) are the most common adverse event in healthcare delivery worldwide and a significant contributor to mortality and financial losses. Because microbial infections typically occur on surfaces – e.g., prosthetic heart valves, urinary and intravascular catheters, orthopedic implants – more than half of HAIs are associated with biofilm formation. 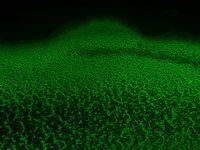 Biofilms are surface-associated, spatially structured bacterial communities, and the high density of these environments enables specialized intercellular communication via quorum sensing. Microbes in biofilms also produce an extracellular matrix (EM) to mediate attachment, immobilize the cells, and promote metabolite transport. The protective coating of the EM shields bacteria from exogenous compounds, reducing their susceptibility to antibiotics by several orders of magnitude compared to free-swimming microbes. Antibiotic resistant bacteria are now implicated in at least 14% of all HAI [CDC, 2016]. The EM is comprised of hydrated polysaccharides, extracellular DNA, and proteins. Proteins in the EM take on a variety of roles, but a growing body of research seeks to understand the role of amyloid fibrils in this complex biological material. Extracellular deposition of amyloid has long been associated with protein misfolding and neurodegenerative conditions such as Alzheimer’s disease, but recent research suggests that many bacteria produce extracellular amyloid fibrils to reinforce the biofilm and resist dispersion by chemical or mechanical agents. These fibrils are biochemically similar to those formed in mammalian disease, but unlike pathological amyloids, bacterial amyloids are intentionally produced to play a functional role. The conservation of the amyloid fold through millions of years of evolution likely relies on amyloids’ universal characteristics – such as backbone hydrogen bonding – rather than specific side chain chemistries. Additionally, amyloid fibrils polymerize in the absence of an energy source, so they serve as a metabolically advantageous molecular scaffold despite the limited resources of the EM environment. 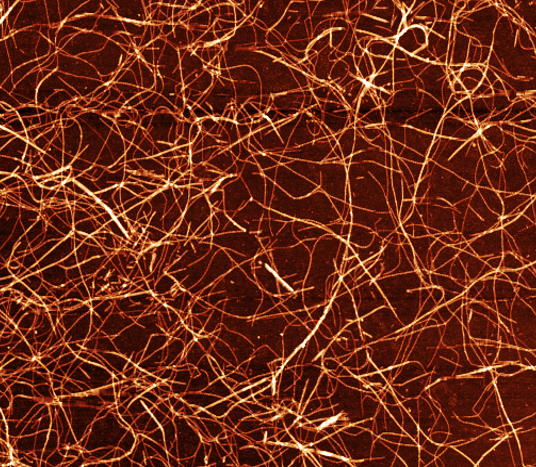 The ability of functional amyloid fibrils to influence biofilm development has made them an attractive target for therapeutic intervention, but efforts to suppress amyloid formation in biofilms remain quite limited. Thus, we developed and tested several peptide designs for their ability to inhibit bacterial amyloid formation in three pathological biofilms – S. aureus, P. aeruginosa, and E. coli. 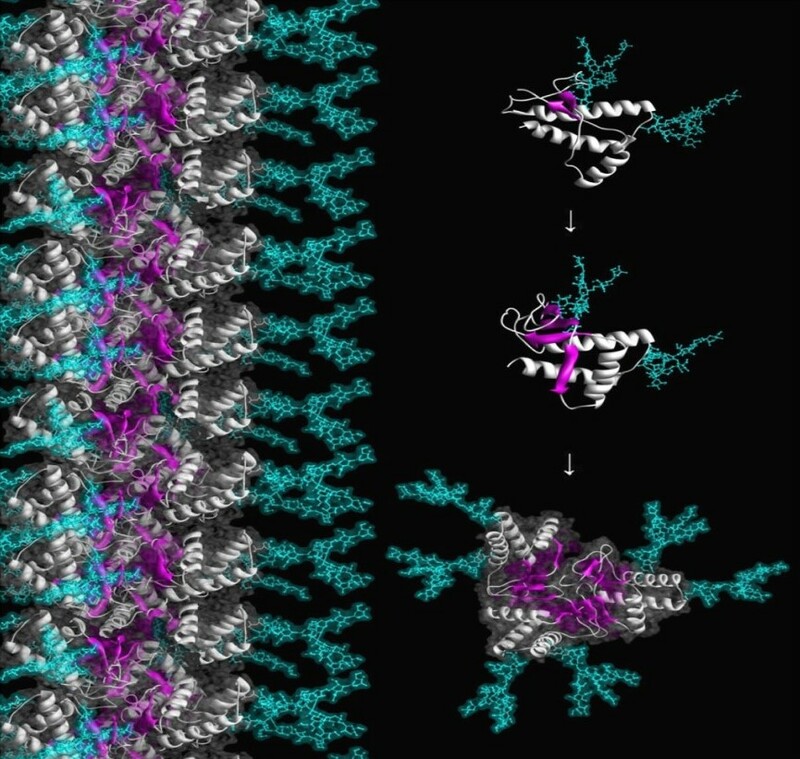 Our design approach, based on unique “α-sheet” structural motifs observed in molecular dynamics (MD) simulations, targets pre-amyloid oligomers formed on the pathway to fibril formation. These results support our hypothesis that α-sheet is a generic structure formed during amyloidogenesis independent of source, sequence and structure. The inhibitory effect of designed α-sheet peptides is shown to persist even in the complex matrix of mature biofilms. Paranjapye, N., Daggett, V. De novo designed α-sheet peptides inhibit functional amyloid formation of Streptococcus mutans biofilms, Journal of Molecular Biology, in press, 2018. Bleem, A., Christiansen, G., Madsen, D.J., Maric, H., Strømgaard K., Bryers, J.D., Daggett, V., Meyer, R.L., Otzen, D.E. Protein engineering reveals mechanisms of functional amyloid formation in Pseudomonas aeruginosa biofilms, Journal of Molecular Biology, in press, 2018. Bleem, A., Francisco, R., Bryers, J.D., Daggett, V. Designed α-sheet peptides suppress amyloid formation in Staphylococcus aureus biofilm. Nature Biofilms and Microbiomes, 3: 16, 2017. Bleem, A., Daggett, V. Structural and functional diversity among amyloid proteins: Agents of disease, building blocks of biology, and implications for molecular engineering. Biotechnology and Bioengineering 114: 7-20, 2017. 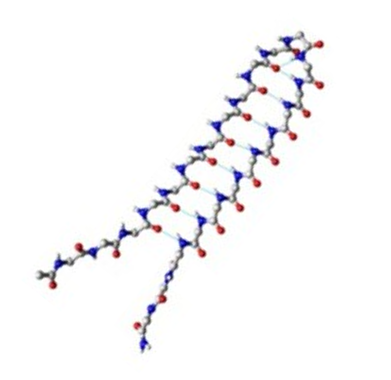 The α-sheet hypothesis was first proposed by Valerie Daggett after Molecular Dynamics simulations of several amyloid peptides/proteins converged on this unique secondary structure. We have been characterizing the α-sheet structure using a variety of both standard and novel experimental methods – using our templated α-sheet peptides – and developing standard assignments for α-sheet structure. The α-sheet hypothesis was first proposed by Valerie Daggett after Molecular Dynamics simulations of several amyloid peptides/proteins converged on this unique secondary structure. We have been characterizing the α-sheet structure using a variety of both standard and novel experimental methods – using our templated α-sheet peptides – and developing standard assignments for α-sheet structure. 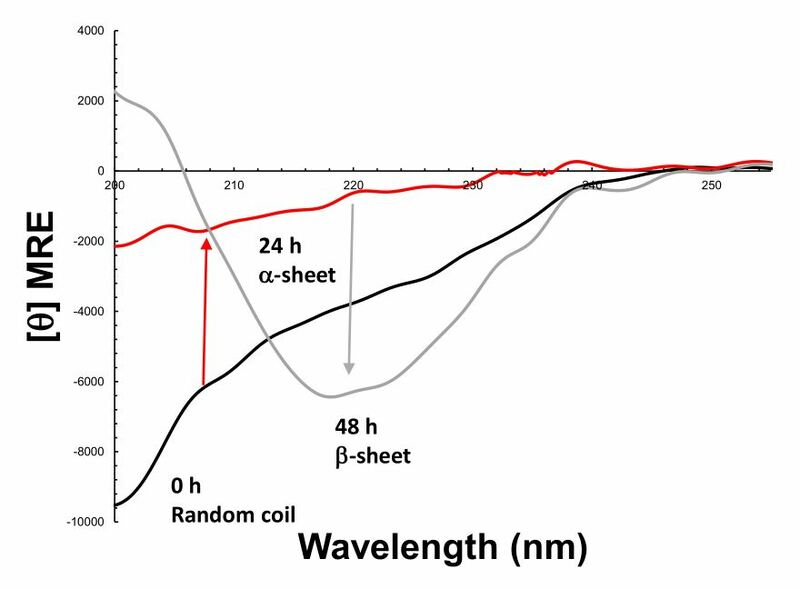 Spectroscopic signatures – using Circular Dichroism, FTIR, and NMR – for α-sheet is distinct from b-sheet, a-helix, and random coil structure. Collaborators at Redshift Bioanalytics have pioneered microfluidic modulation spectroscopy (MMS), which gives solution-based secondary structure information based on absorption of IR light and has shown that the α-sheet structure is unique. By fine-tuning our design process, we are developing better standards for α-sheet characterization and we hope to investigate the spectroscopic signatures of amyloid peptides/proteins throughout the aggregation process to determine the role of α-sheet in aggregation and toxicity. Some proteins are amyloidogenic, aggregating into toxic species. We design proteins with the aim of limiting that aggregation, slowing disease progression. Some proteins are amyloidogenic, aggregating into toxic species. We design proteins with the aim of limiting that aggregation, slowing disease progression. With this goal in mind, we take advantage of the α-sheet secondary structure we observed in many amyloidogenic proteins. By designing peptides (short sequences of amino acids) with α-sheet structure, we found that these peptides preferentially interacted with the toxic intermediates in amyloidogenesis, inhibiting aggregation. We perform MD simulations of proteins under amyloidogenic conditions to gain insight into the early conformational changes associated with amyloid formation. There are now over X human peptides and proteins associated with amyloid disease and the formation of insoluble, fibrillar deposits. Interestingly, these proteins share little in common – they have variable native topologies and secondary structure content (some are even natively disordered), amino acid composition, and native functions. Despite these differences, the resulting mature fibrils and intermediate species share many characteristics. Traditionally, the formulation of diagnostic and/or therapeutic strategies requires structural insight into the target protein. However, the heterogeneous – and potentially disordered - ensemble of intermediate amyloid species largely preclude structural insight through traditional methods such as X-ray crystallography or NMR spectroscopy. To fill this gap, we perform atomistic simulations of amyoid proteins under amyloidogenic conditions to model the early conformational changes that occur during amyloidogenesis. In simulations of multiple proteins, including transthyretin, superoxide dismutase, prion, and lysozyme – we have observed the formation of an unusual type of secondary structure that we have dubbed α-sheet. The unique properties of this secondary structure has guided our lab’s central hypothesis regarding amyloidogenesis and led to the development of peptides capable of inhibiting amyloid formation in multiple systems. Cheng, C.C., Koldsø, H., Van der Kamp, M.W., Schiøtt, B., Daggett, V., Simulations of Membrane-bound Diglycosylated Human Prion Protein Reveal Potential Protective Mechanisms against Misfolding. Journal of Neurochemistry, 142: 171-182, 2017. Cheng, C.J., Daggett, V. Different misfolding mechanisms converge on common conformational changes: Human prion protein pathogenic mutants Y218N and E196K. Prion 8: 1-11, 2014. Cheng, C.J., Daggett, V. Molecular dynamics simulations capture the misfolding of the bovine prion protein at acidic pH. Biomolecules 4: 181-201, 2014. Schmidlin, T., Ploeger, K., Jonsson, A.L. Daggett, V. Early steps in thermal unfolding of superoxide dismutase 1 are similar to the conformational changes associated with the ALS-associated A4V mutation. Protein Engineering, Design and Selection, 26: 503-513, 2013. Van der Kamp M.W. and Daggett V. The consequences of pathogenic mutations to the human prion protein. Protein Engineering Design & Selection 22: 461-468, 2009. Steward R.E., Armen R.S., and Daggett V. Different disease-causing mutations in transthyretin trigger the same conformational conversion. Protein Engineering, Design & Selection 21: 187-195, 2008. DeMarco M.L. and Daggett V. Molecular Mechanism for Low pH-Triggered Misfolding of the Human Prion Protein. Biochemistry 46: 3045-3054, 2007. Daggett V. α-Sheet: The toxic conformer in amyloid diseases? Accounts of Chemical Research 39: 594-602, 2006. Armen R.S. and Daggett V. Characterization of Two Distinct β2-Microglobulin Unfolding Intermediates that May Lead to Amyloid Fibrils of Different Morphology. Biochemistry 44: 16098-16107, 2005. Armen R.S., Bernard B.M., Day R, Alonso D.O.V., and Daggett V. Characterization of a possible amyloidogenic precursor in glutamine-repeat diseases. Proceedings of the National Academy of Sciences USA 102: 13433-13438, 2005. Armen R.S., DeMarco M.L., Alonso D.O.V., and Daggett V. Pauling and Corey's α-pleated sheet structure may define the prefibrillar amyloidogenic intermediate in amyloid disease. Proceedings of the National Academy of Sciences 101:11622-11627, 2004. Armen R.S., Alonso D.O.V., and Daggett V. Anatomy of an amyloidogenic intermediate: Conversion of β-sheet to α-pleated sheet structure in transthyretin at acidic pH. Structure 12: 1847-1863, 2004. The processes by which an unfolded string of amino acids folds into a complex secondary and tertiary structure is still shrouded in mystery. Along the pathway from DNA to functional protein, much is already understood. DNA is transcribed into RNA which is then translated into the primary structure of a protein. Similarly, for many proteins the mechanisms by which they function is well documented. However, the processes by which an unfolded string of amino acids folds into a complex secondary and tertiary structure is still shrouded in mystery. Unfortunately, the variable, dynamic, and short-lived nature of even the most important and stable states along the folding pathway make experimental analysis difficult. Even in simulations, the folding pathway cannot be easily examined because of the incredible computational demand of checking all possible steps that might be taken by the folding protein. These problems are addressed using the microscopically reversibility of protein folding. By studying unfolding pathways in molecular dynamics simulations—a much less computationally intensive task—a great amount of insight can be gained about the folding pathway. From unfolding simulations, it is possible to characterize all important points along the folding/unfolding pathway from the native and near-native states to the transition state to important shared intermediates and the denatured state. By characterizing all of these states, major events in unfolding become clear—loss of hydrophobic core packing or hydrogen bonding, change in dihedral angles, formation of non-native contacts, etc. When these events are understood in the unfolding direction, it can then be shown how they affect the folding direction. For instance, loss of hydrophobic core packing in the unfolding transition state would indicate formation of the hydrophobic core in the folding transition state or highly conserved non-native contacts in a shared unfolding intermediate may indicate that this non-native contact is important to the formation of other parts of the native structure in the folding direction. These sorts of insights can lead to a well characterized and understood folding/unfolding pathway for any protein or protein family. Towards this end, we have simulated over 800 distinct proteins under both native and unfolding conditions for a total of over 6000 simulations. For over 1300 of these simulations representing more than 180 distinct proteins, the transition state has been identified and characterized, and for five of these the transition state was verified against available experimental data. When general properties such as solvent exposed surface area and number of native contacts were calculated for all of these transition state ensembles, it was found that the standard deviations were small indicating that there are common rules influencing the structure and properties of all transition states and folding pathways. The overarching goal then becomes to elucidate these rules through the further study of molecular dynamics simulations. We design homochiral and heterochiral peptides and proteins using computational protein design techniques. Our designs are informed by the results of molecular dynamics simulations, intrinsic conformational propensities, and many more. Computational protein and peptide design encompasses the creation of novel proteins from scratch or the modification of natural proteins, and seeks to identify the optimal amino acid sequence to adopt a specified fold or function. The resulting engineered protein variants can provide insights into the biophysical properties of proteins or be formulated as diagnostic tools, therapeutic agents, or functional biomaterials. 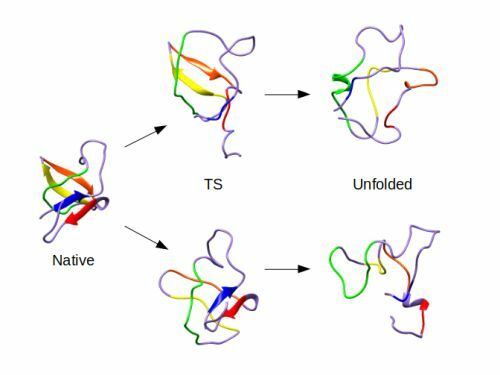 In contrast to conventional protein design strategies such as targeted evolution that construct novel sequences through near-random mutagenesis, computational protein design constructs novel sequences through a combination of biochemical intuition as well as data that reflect our current understanding of proteins in general and for specific folds. For example, in our lab, we have used MD simulations to construct dynamic libraries of amino acid propensities that reflect the intrinsic conformational preferences for the backbones and sidechains of both L- and D-amino acids. 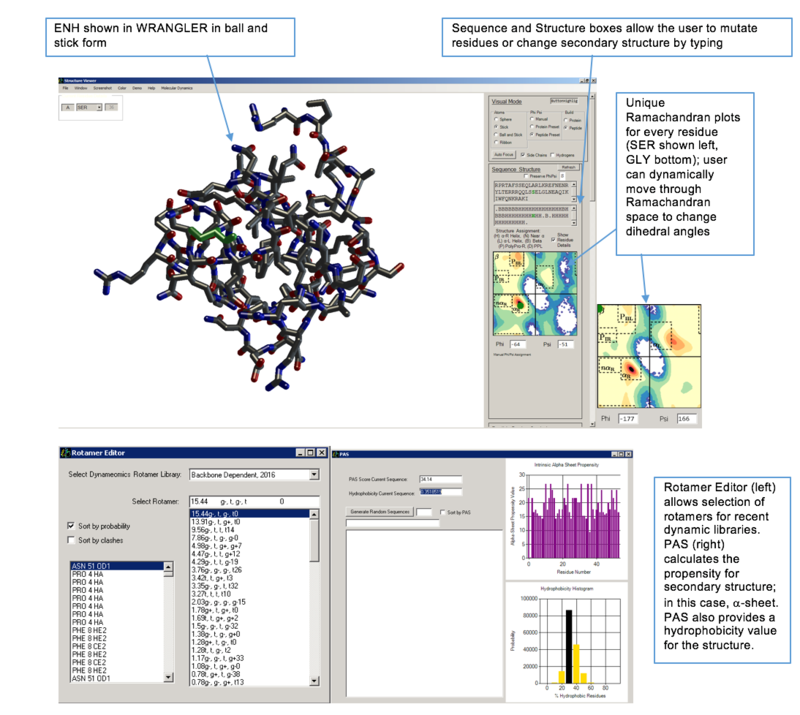 Reference MD simulations of protein designs, fold-family-specific sequence trends, and broader insights from the Dynameomics database also inform protein design efforts. Gianni, S., McCully, M.E., Malagrino, F., Bonetti, D., De Simone, A., Brunori, M., Daggett, V. A carboxylate to amide substitution tunes fold switching in a protein domain. Angewadte Chemie, revision submitted, 2018. Childers, M.C., Daggett, V. Insights from molecular dynamics simulations for computational protein design. Molecular Systems Design & Engineering, 2: 9-33, 2017. McCully M.E., Beck D.A.C., Daggett V. Promiscuous contacts and heightened dynamics increase thermostability in an engineered variant of the engrailed homeodomain. Protein Engineering, Design & Selection, 26:35-45, 2013. Ladurner A.G., Itzhaki L.S., Daggett V., and Fersht A.R. Synergy Between Simulation and Experiment in Describing the Energy Landscape of Protein Folding. Proceedings of the National Academy of Sciences USA, 95: 8473-8478, 1998. Storch E.M. and Daggett V., Molecular Dynamics Simulations of Cytochrome b5: Implications for Protein–Protein Recognition. Biochemistry, 34: 9682-9693, 1995. Childers, M.C., Towse, C.-L., Daggett, V. Molecular dynamics-derived libraries for D-amino acids within homochiral and heterochiral polypeptides, Protein Engineering, Design and Selection, in press, 2018. Childers, M.C., Towse, C.-L., Daggett, V. The effect of chirality and steric hindrance on intrinsic backbone conformational propensities: Tools for protein design. Protein Engineering Design and Selection 29 : 271-280, 2016. Towse, C.-L., Rysavy, S.J., Vulovic, I.M., Daggett, V. New Dynamic Rotamer Libraries: Data-Driven Analysis of Side Chain Conformational Propensities. Structure 24 : 187-199, 2016. Towse, C.-L., Vymetal, J., Vondrasek, J., Daggett, V. Insights into unfolded proteins from the intrinsic φ/ψ propensities of the AAXAA host-guest series. Biophysical Journal 110 : 348-361, 2016. Towse, C.-L., Hopping, G., Vulovic, I., Daggett, V. Nature versus design: The conformational propensities of D-amino acids and the importance of side chain chirality. Protein Engineering, Design, and Selection 27 : 447-455, 2014. Beck D.A.C., Alonso D.O.V., Inoyama D., and Daggett V. The intrinsic conformational propensities of the 20 naturally occurring amino acids and reflection of these propensities in proteins. Proceedings of the National Academy of Sciences USA 105: 12259-12264, 2008. Maris, N.L, Shea, D., Bleem, A., Bryers, J.D., Daggett, V. Chemical and physical variability in structural isomers of an L/D α-sheet peptide designed to inhibit amyloidogenesis. Biochemistry, 57:507-510, 2018. Hopping, G., Kellock, J., Barnwal, R.P., Law, P., Bryers, J.D., Varani, G., Caughey, B., Daggett, V. Designed α-Sheet Peptides Inhibit Amyloid Formation by Targeting Toxic Oligomers. eLIFE 3: e01681, 2014. Daggett V. Shedding light on amyloidosis with protein engineering. Protein Engineering Design & Selection 22: 445, 2009. We develop software in order to improve visualization of protein and peptide structures and trajectories. 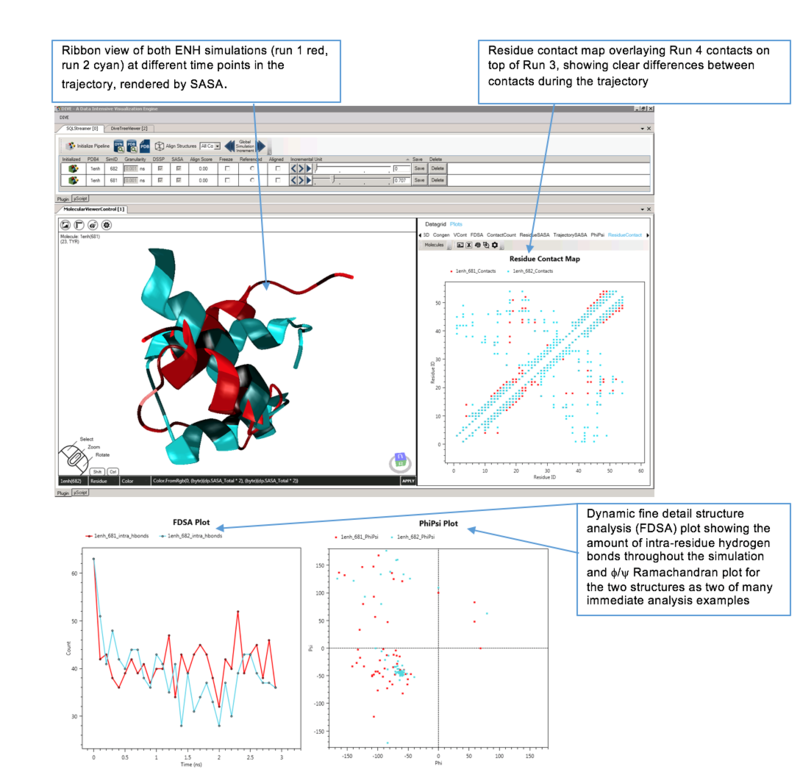 Our current software development is focused on WRANGLER, a protein and peptide design and visualization tool. To learn more, click this box. Our Data Intensive Visualization Engine (DIVE) is a highly powerful, domain-independent analysis tool for complex data. Via a versatile data pipeline, DIVE provides access to the Dynameomics database using graphics, data analysis, and direct SQL. In the image below, DIVE is being used to visualize two simulations of the engrailed homeodomain protein (ENH) simultaneously. Both simulations have been loaded via the Dynameomics pipeline. Via C#-based scripting, the proteins have been colored according to solvent-accessible surface area. From the variety of available real-time plots, a residue contact map throughout the trajectory has been chosen for display, highlighting several differences in contacts between the two trajectories. DIVE can display many other specific quantities, such as the amount of intra-residue hydrogen bonds throughout the simulation in real time, shown bottom left, or a Ramachandran plot of the trajectory, shown bottom right. 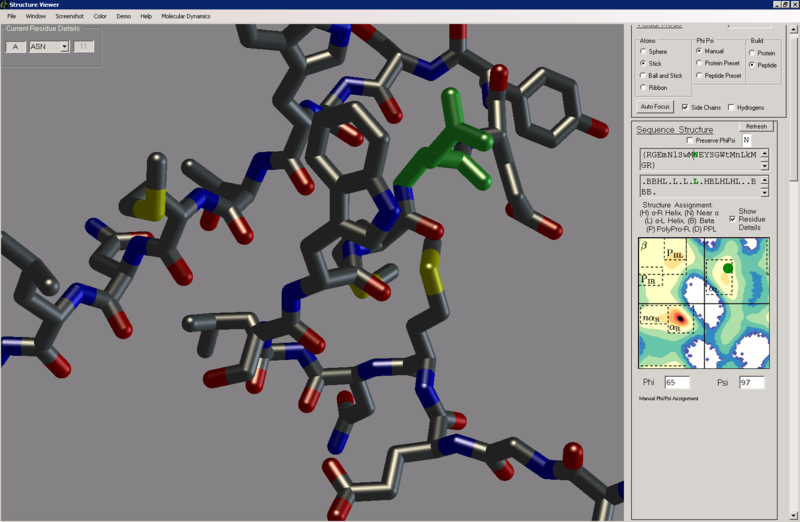 WRANGLER is a design and visualization software currently in development that allows the user to quickly build and mutate peptides and proteins. Though several visualization tools exist, WRANGLER is unique in its ability to design structures very quickly – the user can simply type one-letter residue codes in the Sequence box or even copy and paste in order to build a structure. Then, the structure’s  and  dihedral angles can be adjusted on a per-residue basis using a unique Ramachandran plot for each residue. One can click and drag the tracking button through Ramachandran space in order to find desirable structural conformations. Additionally, WRANGLER incorporates the most updated 2016 backbone independent and dependent Dynameomics rotamer libraries, as well as libraries specific to the intrinsic conformations of peptides surrounded by l- or d-amino acids. WRANGLER also provides calculations and graphs for the -sheet propensity, propensity by residue, and hydrophobicity compared to randomly generated -sheet peptide sequences. A random sequence generator in this tool can be used to aid design. More computationally dervived conformational propensities are on the way, including those for -sheet and -helix, to aid in secondary structure prediction based on local residues and interactions.